Charlotte Rosetta Esselman (nee Schultz), age 87 of East Van Buren Street, Port Washington died peacefully with her family at her side on Sunday, September 7, 2014 at her home. Charlotte was born on July 26, 1927 in Saukville, WI, daughter of the late Herbert and Mamie Meyer Schultz. On June 19, 1948, she was united in marriage to Donald N. Esselman of Trenton, WI at Holy Trinity Church in Newburg, WI. They resided in the Town of Port Washington and started a family of eight children. In 1965, they moved to Port Washington, remaining on Van Buren Street for over 49 years. In her early years, Charlotte worked at the shoe factory in Cedarburg. In 1971, Charlotte started working at Tecumseh Power Products in Grafton, WI. Shortly after her 62nd birthday in 1989, she retired from her production work duties to remain a full-time Mom and Grandma. The family attended church at St. Peter’s Church in Saukville. Upon moving to Port Washington they became members of Friedens Evangelical Church. There were so many things that Charlotte enjoyed, but not as much as her family. Hobbies like gardening, weed pulling, collecting hummingbird keepsakes, camping and playing Bingo kept her busy. She most enjoyed waiting for the phone to ring in the hopes that someone was going to come and visit or to take her and Dad on an adventurous drive. 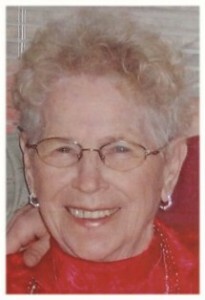 Charlotte had been a member of the Landt-Thiel Woman’s Auxiliary American Legion Post 470 in Saukville for many years. She is survived by her eight children; Gordon (Bonnie) Esselman of Port Washington, Gary Esselman of Pembine, Gayle Gallipeau of Saukville, Gregg (Tina) Esselman of Dousman, Geralyn Esselman of Port Washington, Gene Esselman of Cedar Grove, Gloriann Esselman of Kimberly and Glenn (Beth) Esselman of Port Washington; 18 grandchildren, 19 great-grandchildren and one she had not yet met. Charlotte is further survived by her brothers Lester (Carol) Schultz of Cedar Grove, Earl (Helen) Schultz of Grass Valley, CA and Donald Schultz of West Bend; brother-in-law Roger Geib of Saukville, sister-in-law Ceil Menzel of West Bend; nieces, nephews, many other relatives and friends. She is preceded in death by her husband Donald N. Esselman on September 12, 2011; her parents Herbert and Mamie Schultz, her in-laws Frank and Mary Esselman, her sisters Mildred (Ralph) Wegner and Audrey Geib, her brother Harold (Renata) Schultz, sisters-in-law and brothers-in-law Karen Schultz, Laura (Clarence) Reichart, Hildegard (Albert) Luebke, Marcella (Lawrence) Blazel, Thecla (Leroy) Fischer, Marion (Forest Miller and Ben Jamrosy) Miller, Rosalie (Al Westphal and Wally Beimborn) Westpahl and Floyd Menzel. Memorial funeral services 6:30PM Friday, September 12, 2014 at Friedens Evangelical Church, 454 N. Milwaukee Street, Port Washington. Pastor Brandon Lemons will officiate. Visitation 4-6:30PM Friday AT CHURCH. Interment Lakefield Cemetery, Lakefield, Town of Grafton, WI. Memorials are appreciated. Previous Post: Harrigan, Michael T.
Next Post: Dimmer, Leila C.